Israeli soldiers kidnapped, on Tuesday at dawn, two Palestinians in the northern West Bank city of Tulkarem, and three others in the southern West Bank city of Hebron. On Monday evening, the soldiers kidnapped a shepherd near Hebron. The Tulkarem office of the Palestinian Prisoners Society (PPS) said that soldiers invaded and searched several homes in Thannaba area, east of Tulkarem, and kidnapped Mo’men Ahmad Abdullah, 21, and Hani Binan Suwwan, 20. Suwwan is the brother of Luay, who is a political prisoner held by Israel after being sentenced to 14 years. 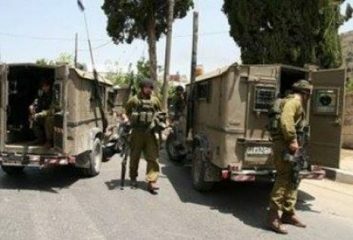 In addition, the soldiers kidnapped three Palestinians, after invading their homes in the southern West Bank district of Hebron. The Hebron office of the PPS said the soldiers kidnapped Awadallah Hatem Qar’eesh, 23, from Yatta town, Hotheifa Mustafa Eghneimat, 23, from Surif town, and Ayyoub Abdul-Qader Abu Awwad, 35, from the al-Fawwar refugee camp. On Monday evening, the soldiers attacked a shepherd herding his sheep in Surif town, near Hebron, and kidnapped him, leaving the sheep behind. Local sources said the kidnapped Palestinian has been identified as Hotheifa Ali Eghneimat.